If you want to experience the charm of Jammu and Kashmir with a chill down your spine, try mountain cycling in its challenging terrains. In fact, cycling is the best way to explore this pristine Indian state enriched by the beauty of nature. There is so much on offer in its rough trails, beautiful lakes, and high mountain passes against the perfect background of snow covered mountains. The state offers you enough for an adrenaline rush. On one side, you can discover the picturesque views of Kashmir valley and on the other hand, there are tough tracks of Ladakh to enjoy every bit of your cycling tour. The state has numerous options for cyclists and mountain bikers. From short to long, you can spend as much time as you love in this activity. Most of the roads in this state are paved yet they are tough to explore on wheels. Instead of trying meticulous climbs of high mountains in this state, you can enjoy the thrill of riding a cycle to reach the farthest point possible. This way, you can experience the real beauty and enchantment of Kashmir. Cycling trips offer you dekko at prehistoric routes of Trans Himalayan traders, lush valleys, gushing streams, waterfalls, and quaint villages falling en route. There are religious sites of Jammu, snow covered valleys of Kashmir, and monastic tours of Ladakh to enjoy in cycling trips. Ladakh is the most preferred cycling route in Jammu and Kashmir, but there’s more than that. Here, we are mentioning top cycling destinations of this state where you can enjoy the most memorable experiences of mountain cycling. Ladakh is certainly the most exhilarating cycling destination in Jammu and Kashmir. 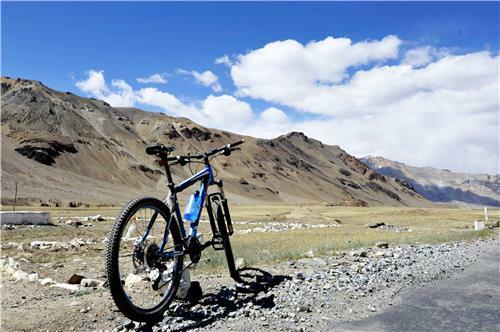 Most of the cycling tours begin from or end at Leh, the capital of this region. This trek offers breathtaking views of Himalayan ranges and enchanting Buddhist Gompas while cycling past them. You can take a delightful break at Leh to unwind and enjoy the allure of this serene city. If you come through Manali route, you’ll need to cross Indus and reach Thiksey Monastery after which Leh is the next point. 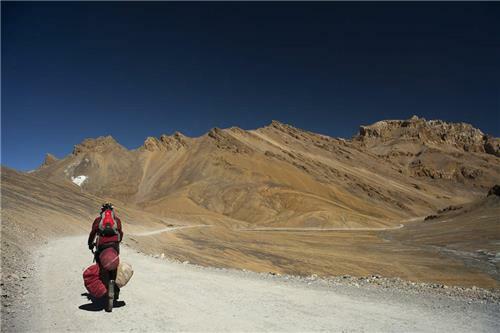 From Leh, you can begin your trek to Khardung La Pass, the highest motorable road in the world. While cycling through all these routes, don’t miss out on the local delicacies including steaming bowl of noodles, momos, black tea, and pancakes with jam. This is a 64 km long stretch of road. Be prepared to have some meandering turns of Himalayan roads en route. This trek begins from Leh city and takes you to the famous Alchi Monastery. After reaching the final point, you can enjoy the panoramic views of valley lying beyond this monastery and also have a pleasurable time at this ancient Gompa. This route beginning from Leh measures up to 45 km till you reach your destination at Hemis. There is an old monastery and Hemis National Park that you can include in your itinerary for this tour. It passes along the famous Indus River. You can catch the glimpses of gompas at Shey, Thiksey, and Stok while taking up this route. This is an exciting cycling route taking you to the most picturesque lake of Jammu and Kashmir. En route this track, you can camp at Durbuk. There are many monasteries falling midway that you may avoid if not very keen on visiting all of them. You will reach Pangong Lake through Spangmik Village. This is a totally mesmerizing sight with colorful flowers, and pristine waters of lake captivating your imagination. To get back to Leh, you have to cross the Tanglang La pass and reach Tangtse village. This is a shorter route but the most nerve wrecking one. At whooping height of 5380 m, it is the highest motorable and the most challenging road for cyclists. It takes three hours to travel distance from Leh to this pass. Once you reach the top of it, you’ll feel like on top of the world. Alluring vistas of nature will fascinate you at Khardung La. After some photography sessions and sightseeing, you can cycle back to Leh and rest for overnight to resume your plans for the next day. This route covers distance of 75 km. All through this stretch, you’ll be never short of beautiful sights of nature scattered around you. Sonamarg is one of the top most travel destinations of Kashmir and exploring it on a mountain cycle is the best thing to do. It offers you an upward climb of 2000 meters. Valleys and high peaks covered with snow are delightful retreats for the cyclist climbing up these heights. Srinagar to Gulmarg is around 53 km in distance. This Meadow of Flower at height of 8700 m is worth exploring on a cycle. Take a halt at this destination to explore the beauty of Gulmarg, which is also a popular ski resort of this state. Mamer is a tranquil village located 50 km away from Srinagar. While cycling to this destination, you will pass through paddy fields of Ganderbal and orchid farms of Zakura. This cycling route requires you to drive along the banks of River Sind. When you reach Mamer, you must enjoy fishing and angling, which are the popular activities available here. This is a longer route that covers distance of around 105 km. From Sonamarg, your expedition will pass through Zojila Pass till Menamarg. This is also an enchanting place where you require undergoing passport verification to continue further. From Menamarg, the cycling route goes to Drass city and then, up to Thasgam, where you can camp for overnight. From this place, you can ride your cycle along the Drass River to reach Pashkum after driving past the city of Kargil. This is the most conclusive cycling route in Jammu and Kashmir. It includes even most of the above mentioned routes as well. This route traverses approx 450 km of scenic roadsides, country sides, meadows, forests, lakes, rivers, and what not. It passes through the major attractions of this state including the enchanting gompas of Ladakh and pristine lakes of Kashmir valley. The first stop of this trail is at Ganderbal and then, you pass through destinations like Sonamarg, Drass, Bodhkarbu, Uletokpo, Kargil, Mulbekh, Basgo, Lamayuru, and Saspol. There are around 10 high mountain passes that you’ll cross in this route. These passes encompass the likes of Zojila, Namika La, Fotu La, and Khardung La. It takes total 13-15 days to complete this track on wheels. These are the amazing cycling routes that you can undertake on your bike while planning a trip to this state. Cycling in Jammu and Kashmir is a satisfying experience for every adventure freak but it requires some strong guts from you. It is a strenuous exercise that calls for more stamina and strength. Before starting your trek on wheels in this state, there are certain requisites that you must understand. In Himalayan region, cycling is the most exciting activity that you can indulge in. You can take up your cycling trip in two ways. Either you carry all your essentials on your bike or you can hire a support van carrying your belongings to make your voyage lighter. You need to be physically fit and sturdy to cycle on the rough roads and high altitudes of this state. Jammu and Kashmir offers you challenges in any season and weather. But for tough expedition of mountain cycling, summer is the best time. Months from June to September allows you to cover such long distances under a clear sky. There are lesser dangers of mountainous terrains and roads are also open during these months. Remember that during winter months, most of the roads in this state remain closed due to heavy snow fall and land sliding.